Andrew Belkus - a Future Golf Champion ! 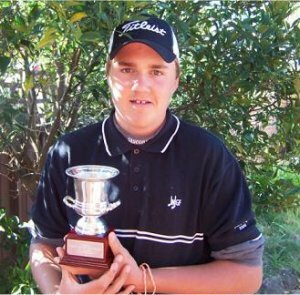 Andrew Belkus, a 13 year old Australian Lithuanian from Sydney, on April 18,2006, was invited to take part in the golfing NSW State Age Match Play Championship. The championship took place at the Camden Valley Golf Resort, outside Sydney. In Match Play two players compete against each other and it does not matter how well or badly they play, so long as they win against the other person. In the beginning Andrew played badly and lost his first match, but after a while he got into the "swing" of things and began to play very well, getting into the finals. In the finals Andrew again started badly, but as a true champion, he did not give up and finished as the winner, becoming the NSW golfing Junior Match Play Champion 13 year Division.